Directed by Michele Lupo, who's movies are filled with over-the-top action and boisterous, brawny men. Both Roger and Pietro are still with us in the land of the living. Roger was interviewed recently over his film career and aside from Lupo's films, he admitted that he didn't care much for them. He thought they were too difficult to make (which I can image they were). His career continued with Eurospy films and exploitation films in the 1970s. It eventually died out during the 1980s. As for Torrisi, his career , he continued on appearing in plenty of movies, mainly in small supporting roles during the 1970s but experienced a big comeback during the 1980s, with a series of super low budget Italian movies inspired by the success of CONAN THE BARBARIAN (1982). 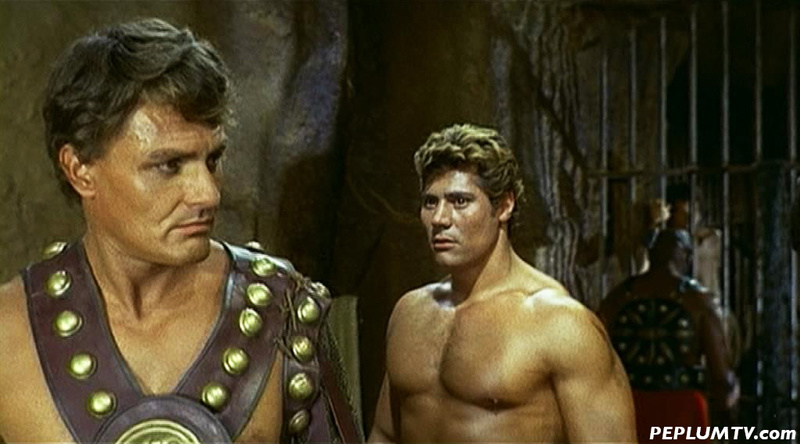 I recently watched a film called HERCULES AGAINST KARATE (1973), in which Torrisi has a small role (during a bar brawl). If you blink, you'll miss him. It would great to have an extensive interview of him. I'm sure he had fun making these films. I'm sure he has tons of stories to tell. I think not giving him bigger roles during the Peplum boom was a great missed opportunity for the Italian film industry.